My son wet the bed, child enuresis? 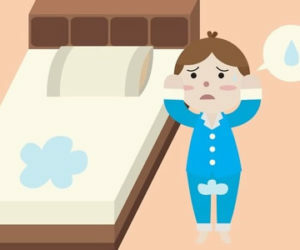 Infant enuresis is defined by the International Incontinence Society of children as “a urinary incontinence that occurs during sleep.” At the terminological level childhood enuresis occurs intermittently during the night . But, when is it considered a real problem? According to the ICCS, there is a problem of infant incontinence if the age of 5 years is exceeded . That’s why if you’re wondering about that “my son wet the bed” you do not have to worry if he’s younger. Let’s see more about nocturnal enuresis in children, the causes and how it can be solved. Does your child wet the bed? First of all, this article is informative and ideally you should contact an expert psychologist. Urine leakages are common: At least 2 nights a week, 1 night a week and 2 nights a month although these characteristics are not accepted by all. The scientific community does agree that when, at least, the child has losses 4 nights a month, it can be called incontinence. Currently, children’s enuresis affects between 10-13% of the children. children of 6 years of age. From 10 years down to 6% of the total. How to find out if my son wet the bed for psychological reasons? There is a great controversy around child enuresis because while some experts say that in most cases its origin is physical, other professionals believe that it has a psychological basis. In cases of enuresis from this last perspective we find that there is a certain etiology. The reasons why infant enuresis is maintained are closely related to the psyche. Although a child has physical causes for nocturnal urine leakage, in most cases it is maintained by psychological causes . This is confirmed by experts in the field. Physical factors : genetic, hereditary or delayed development of the central nervous system. Psychological factors : stress, psychological factors , sleep disturbances, among others. Treatment usually includes the intervention of a psychologist and a specialized pediatrician. In some cases, especially when the child reaches 10 years of age, the level of emotional stress generated is very high. In these cases, psychological intervention is essential since the treatment of incontinence adds other problems such as low self-esteem or insecurity. There are different approaches to treatment that range from the control techniques of pelvic floor contraction to psychological therapy . The psychologist delves mainly into the origin and development of this problem. The importance of multidisciplinary intervention between this specialist and other medical agents is essential for healing. The most frequently used psychological techniques are alarm method and dry bed training ] In both cases the child will learn to hold urine. Alarm method: This technique is heavily influenced by the behavioral tradition and involves the placement of a device in underwear that ” warns “before the little one urinates. After a series of repetitions the child himself learns to control it. Likewise, it must be complemented with other forms of learning. Dry bed training: Complementary behaviors are very important. For example, the change of bed linen and sheets after the episodes. It is also necessary to supplement also with psychological therapy for the reinforcement of self-esteem especially among children over 5-6 years of age. From a physical perspective other factors should be taken into account. factors that we have already explained that are also determinants. In fact, there are specialists who claim that in 90% of cases of children with enuresis in children have a physical origin. This is the case of the reduced capacity of the bladder, among other alterations such as learning failures.